Socrates (469 BC – 399 BC) was an ancient Greek philosopher widely credited with establishing the basis for Western philosophical inquiry and the Socratic method of both debate and teaching. He is said to have been poisoned after being condemned to death by an Athenian court for impiety and corrupting Athenian youth through his teachings. He chose to die by drinking hemlock, whose active chemical, the alkaloid coniine, can cause paralysis, convulsions, and death. Most information on Socrates comes from his contemporaries, including Xenophon, and his students, most notably Plato. 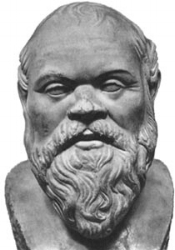 Socrates' influence upon toxicological study rests mostly upon the manner of his death. After being tried and convicted of corrupting the youth and inventing new deities, he was sentenced to die by drinking hemlock. He was given the option of death or leaving Athens, but he felt it would be more dignified to die in his home city. He therefore, at the age of 70, administered the poison himself. The entirety of what is known about Socrates comes from other people as none of Socrates' writing survived. Plato, one of his students, and Xenophon, one of his contemporaries, are the main sources of information about his life. What is known is that he was married with a few sons and that he most likely served in the Greek Army; his experiences in war greatly influenced his ethical teachings. He devoted the majority of his time to discussing philosophy and may have relied upon the generosity of others to support his lifestyle. Socrates' trial coincided with a tumultuous time in Athens. The court was heavily influenced by the notion that gods were directly involved in the protection of certain cities, including Athens. The defeat of Athens in the Peloponnesian War was taken as a sign from Athena that the people of Athens were impious, and the leaders felt that Socrates was leading the citizens toward other gods. Socrates flatly denied these claims. The charges stemmed from an inquiry Socrates undertook to see if anyone in Athens was smarter than he. After he completed his investigation, based on the fact that no one seemed to know anything, he concluded that he was the smartest because he knew he knew nothing. His superior intellect made fools of the Athenian officials he questioned publicly and thus, felt their wrath. His most important contribution to modern thought, other than instructing Plato, was his pedagogical style. The Socratic Method is a dialectic method of inquiry: answering a question with a question. It was used primarily to investigate ethical and moral concepts. Because of his contributions he is credited as the father of modern Western thought.